Fourth day of Australia tour, October 19, Friday took place in Sydney. 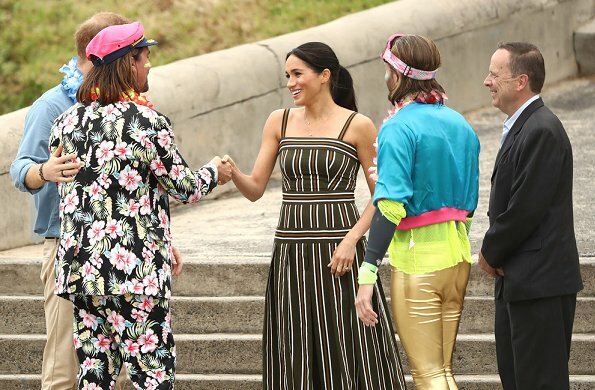 In the morning, The Duke and Duchess of Sussex visited Bondi Beach, one of Australia’s most famous landmarks. 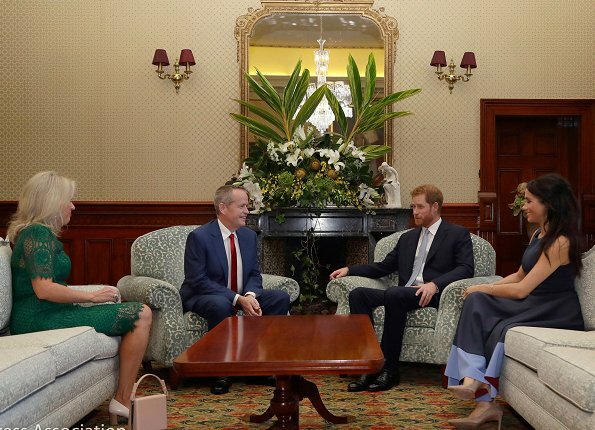 The Duke and Duchess met with a local surfing community group, known as OneWave. 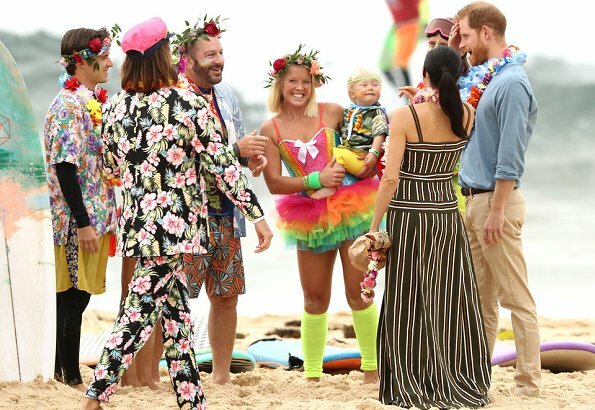 The Duke and Duchess attended the "Fluro Friday" session, where people of all ages share their experiences of mental health issues, and had the opportunity to interact with others enjoying yoga and surfing. 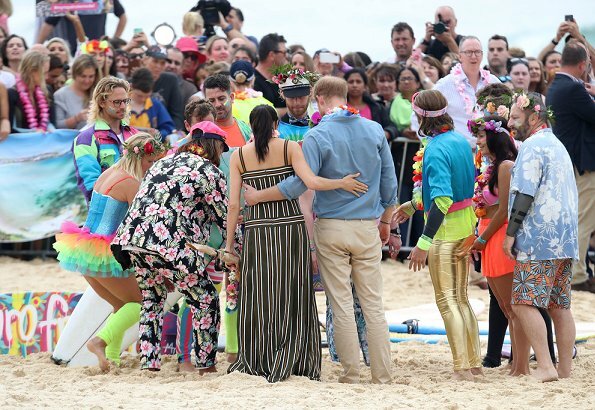 Before departing, The Duke and Duchess had an opportunity to meet with members of the public gathered on the beach. 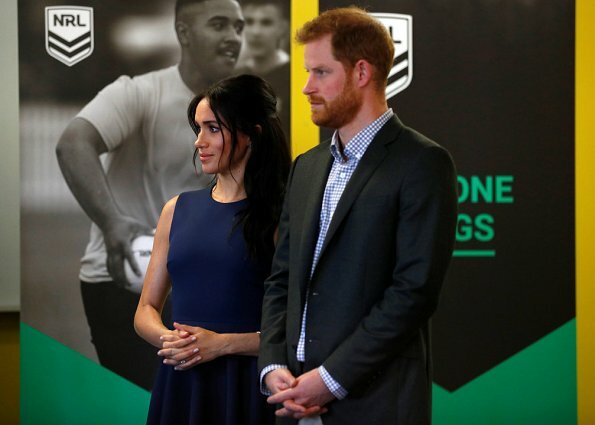 Magnifique Meghan Ils sont solaires Félicitations! adequate "beach wear", skirt a bit too long for me. Lovely dress for the beach. Harry has funny shoes - like them. I want that dress, it's so pretty! They are so happy, nice occasion. Nice, interesting dress. I like the one, the dark blue with light blue trim, she wore for the school outing today a little bit more. Any pictures? Please....Thanks! The blue dress is nice, but the brown-striped thing is really awful, I don't like it. They are doing such a great work both with this casual style as being like anybody else. I am sure they are both very much loved in Australia. Meghan has lovely posture. I like both dresses. The striped one was good for the beach because it would not blow up in the wind. The blue Roksanda is elegant and suits her perfectly. There’s nothing nice in the striped dress. The blue dress is ok, but not the prettiest! The striped dress looks great on her but many women could not wear that dress. It emphasizes the hips in a negative way if you have even a little extra weigh on you. The blue one is lovely and she looks wonderful in it. She certainly seems to be gliding through this pregnancy since this early on many women feel terrible and are extremely tired, not to mention morning sickness which many suffer from. Good for her to take on this type of busy trip. Nice dress for the beach, but a bit too long. 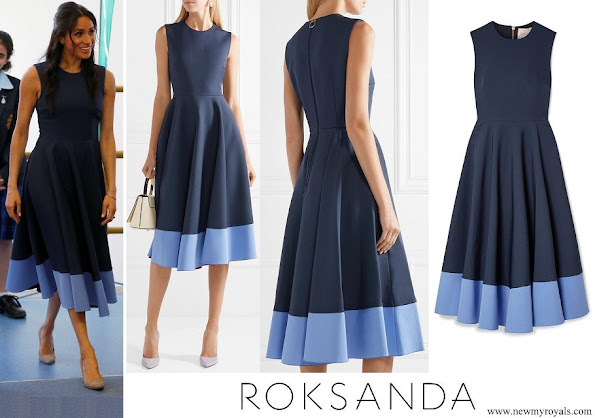 The Roksanda dress is very nice and Meghan looks great in it. Love the two tone blue this is a stunner. Folks the dress was longer looking because she took her wedged heels off. She is barefoot. 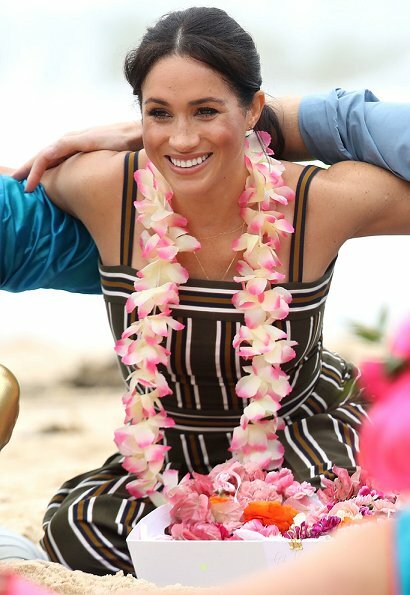 Meghan looks comfortable and appropriate for each occasion. The striped dress hits all the right notes and she looks great in it. 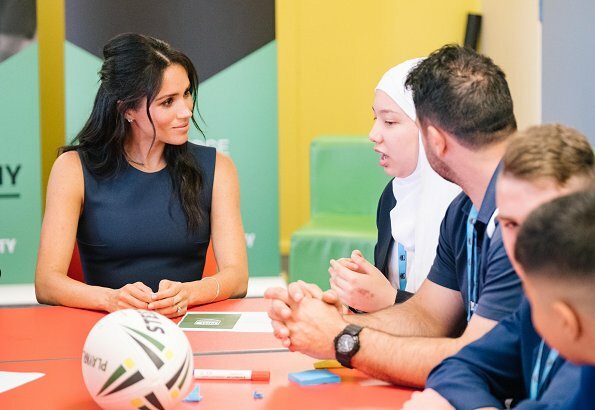 The best thing about Harry and Meghan is that they present themselves in such a relatable, down to earth way. 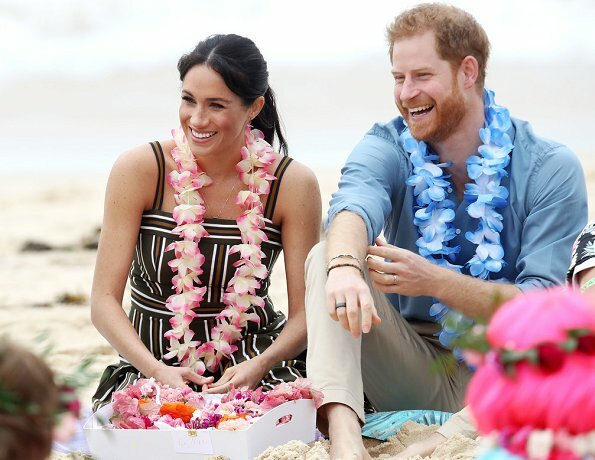 For those complaining about the striped Martin Grant dress being too long, Meghan was wearing a high heeled espadrilles that she removed to go barefooted in the sand, just as Harry did. The blue Roksanda is a wonderful dress. Blue looks so good on her. 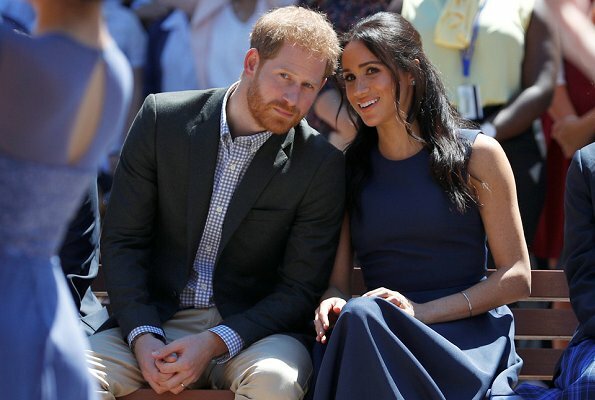 The blue Roksanda looks good on Meghan. Fingers crossed we're on an upward trajectory on what has been a disappointing tour so far. Just curious what has been disappointing? Which is in your opinion gone wrong? I guess I know what you mean.. in my eyes the tour is really, really boring and we didn't see any fascinating or 'wow'-styles yet. Thanks, Anna B. That is exactly what I mean. It's lovely to see the two of them together but as far as clothes are concerned it's been one dull outfit after another. Thinking back to the tour of Charles and Camilla earlier this year, the Duke and Duchess of Cambridge, Crown Prince Frederick and Crown Princess Mary and even Charles and Diana back in the 80s, I can remember outfits from each one. So far, almost everything Meghan has worn has been unexciting. 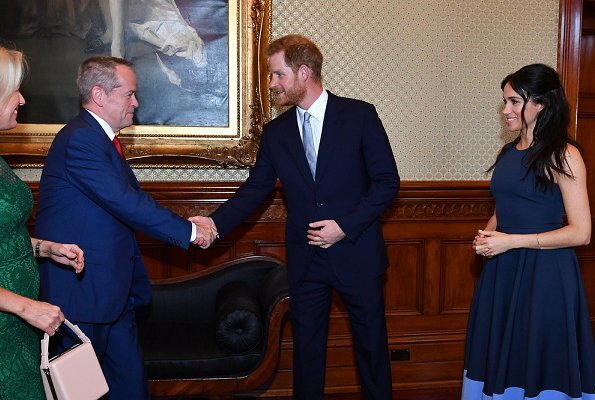 Harry climbed the Harbour Bridge with the Prime Minister and hoist the Invictus-Flag, great cause. His second time on the bridge and today he works for his little family - times are changing.